We met the man behind the car, designer Jean-Marie Massaud, to see how he came to work on the ME.WE and why it could point to a new way to making and designing vehicles. You can find out more about the story of the ME.WE here, and get the details on the Designs of the Year exhibition in this post. Toyota Blog: Hi Jean-Marie, how are you? Jean-Marie Massaud: I am very well thank you. It is good to be in London and part of this show. TB: Were you pleased to hear ME.WE was selected as one of the Designs of the Year? JMM: Of course, this is a good honour for our work and I am pleased that the ME.WE has been recognised for offering something different to normal cars. TB: What is the key idea behind ME.WE? 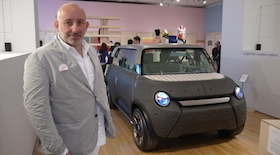 JMM: It is a car that I think represents modern life. It represents simplicity with comfort, a reduction in materials but still has space and practicality. More people live in cities, so a car needs to be small, but this should not stop people from exploring and going away with friends and luggage. It’s very simple, there is an aluminium frame covered by a soft polymer for waterproofing, then there is just the body panels, which are basically air and shock protection. It’s not a status symbol – it’s about lightness, low maintenance and low impact on resources. TB: It’s not a large car – why did you want it to be spacious? JMM: ME.WE is actually smaller than the Fiat 500 – it doesn’t look like it but it is 15cm shorter. You can carry luggage in the boot, on the rear with a shelf and on the roof under the neoprene tonneau cover. I like city cars, but if I sit in some of them I’m too big on my own, even without four people. They are great for the city but it might not always be a main car for a whole family. The intent with ME.WE is to show a car that can be safe, light and simple to make and offer flexibility and ease of use. TB: Why is simplicity so important? JMM: Simplicity means it is easier to build and maintain, but it actually still offers the same service as a traditional car – transportation. It’s a new low-cost car, not a cheap car. The thought process behind it is about being smarter. You don’t need to spend money on maintenance because parts are replaceable, and you don’t have to worry about leaving your car somewhere because the EPP (expanded polypropylene) cannot be scratched. I would compare cars with flights. Some years ago certain people would never fly on certain airlines, but that has changed. If you’re taking a one-hour flight you will probably fly with Easyjet, there’s simply no use in paying more if you don’t have substantive benefits. TB: ME.WE uses some uncommon materials for a car. Why did you do this? JMM: I wanted to try using materials like the EPP body and the bamboo interior because they are robust but also sustainable – EPP is recyclable and the bamboo is a natural material. So they are easy to replace but also simple to look after and maintenance costs would be low. If you were to crash it, the body panels are effective at absorbing the impact, but they can also be replaced very easily if necessary. TB: Do you think sustainable materials will more widely-used in cars in the future? JMM: The most important things in today’s business are offering good service, pleasure and responsibility. There are some things that all people need to buy but they must be desirable and sustainable as well. You can have chairs made from sustainable wood, but it’s hard to take products like this out of the prototype stage into wider production, because of the cost. EPP is easy to use and re-use, and bamboo grows quickly so it can be easily produced. TB: This is the first car you’ve designed. Did you enjoy the process? JMM: Absolutely, I like to work in different fields. I have an understanding about what is under the shell of a car and the production process and the marketing issues, but it was really interesting to test myself in a new area. You cannot imagine designs by working in one field. The Toyota team at ED2 showed me they study all kinds of design so they see lots of influences that can be applied to vehicles. They are super-interested in working, questioning and thinking about everything and this is part of life. TB: How did the collaboration with Toyota and ED2 come about? JMM: I wanted to see the modern way to invest in transportation, because I like cars but I’m not a fan of maintenance. I like a nice car but I don’t care about it in this way. The Toyota team contacted me, I discussed my ideas with them and Mr Okazaki, the president of ED2, and he told me ‘OK, go ahead, carte blanche’. Find out more about ED2 here. TB: ME.WE was designed as a concept car, but would it be possible to make it? JMM: You might have to change some small details, but yes. You don’t need a big factory, the production is super-simple. There’s no need for a big steel press or a place where you have to treat it and paint it. You can put the parts together quite simply because everything is operated by wire rather than mechanical parts. TB: What do you see as the main manufacturing challenges for the auto industry? JMM: The key in manufacturing is developing standards so that products and components work together. You then create individuality within those limits – this would be much more flexible. Everyone wants things to be different from each other and customisation is a big trend for cars recently, but it can take six months for an order to be made. I think we need to make this process of building cars simpler. TB: Has ME.WE been developed since it was unveiled last year? JMM: No we didn’t develop the car since last year. It was a study, a concept car and that’s it. I guess some of the ideas may be taken up but you won’t see this actual car on the road. TB: What did you make of the response to ME.WE? JMM: We received a good response. Some people were very interested in this approach but some thought it was too crazy. I don’t think they always understood our approach – everyone always thinks cars are designed only to be attractive and to have a sculptured body that reflects sunlight beautifully. That wasn’t what we were trying to do. I prefer to choose smartness and sensitivity than making statements and cosmetics. TB: Thanks for your time M. Massaud.